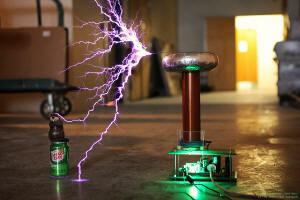 Introducing my first Double Resonant Solid State Tesla Coil, which will be referred to as DRSSTC 1 from now on. In many ways, this Tesla Coil represents a milestone in my Tesla Coiling journey since 2003 when I first built Tesla Coil 1. 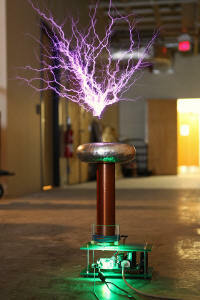 Last year in 2012, I completed my first Solid State Tesla Coil 1, which was a great learning experience. Through the project, I learned many things about SSTCs and decided to embark on my first DRSSTC. 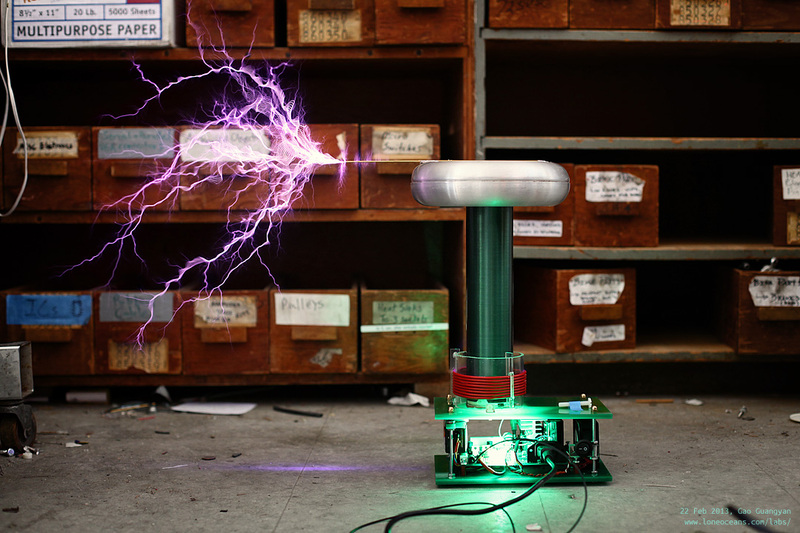 The DRSSTC was invented sometime around 2005, and differs from a traditional SSTC with the addition of a primary tank capacitor, running at higher peak currents for bigger sparks. 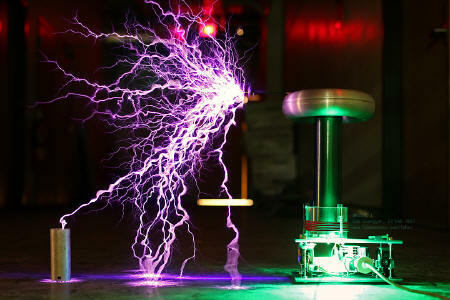 These new breed of SSTCs essentially represents the most efficient, controllable and efficient Tesla Coils to this day at time of writing (2013). 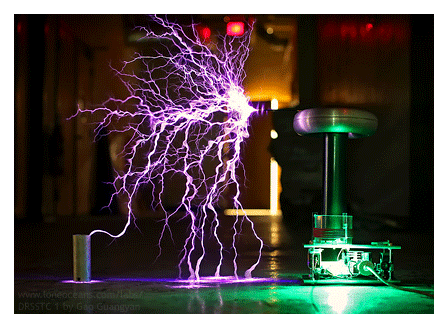 Nikola Tesla would have been pleased, I think! This webpage serves to document the design, construction, lessons learned and results of my first DRSSTC, and I hope it will be a source of information and inspiration to the Tesla Coiling community - a community which I've had the pleasure of interacting with and learning so much from. 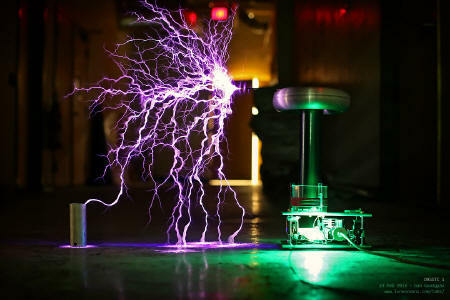 The goal at the end of the project is gain understanding and knowledge to design and construct a future more powerful DRSSTC with a spark length exceeding my venerable Tesla Coil 2. For now, the goal of DRSSTC 1 is to produce a reliable, beautiful and powerful table-top DRSSTC. I do not know of any other DRSSTCs built in Singapore by any fellow friends in Singapore. DRSSTC 1 may be the first of it's kind in my little sunny country! Thank you for visiting my page and if you have any questions, wish to share your projects, or feel that my projects have inspired you in one way or another, feel free to email me at loneoceans[at]gmail(dot)com. Current Project Status (Mar 2013) - DRSSTC 1 has now gone through revision 2 and has spectacular performance! More testing to come soon. Right now it's limited by hitting the floor. DRSSTC 1 rev 2 plays music - as controlled via a Midi keyboard, ~100us or less on-time per pulse. For much more videos and images of the coil in action, please scroll down to Results & Media! 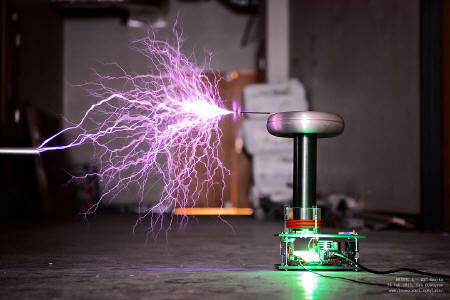 The double resonant solid state tesla coil is perhaps the pinnacle of Tesla Coiling (though more complex models with clever control techniques are pushing the boundaries once again). Having built SSTC 1 last year, I figured that it would be a good time to build my first DRSSTC. As my first DRSSTC, this was primarily a learning project for my future projects. I wanted to go for something simple, small, and manageable. I've had the fortune of being in the good company with some brilliant coilers (like Bayley, Tyler, Kramnik), and managed to get an older pre-production version of the oneTesla driver, which was later modified and tuned for good operation. 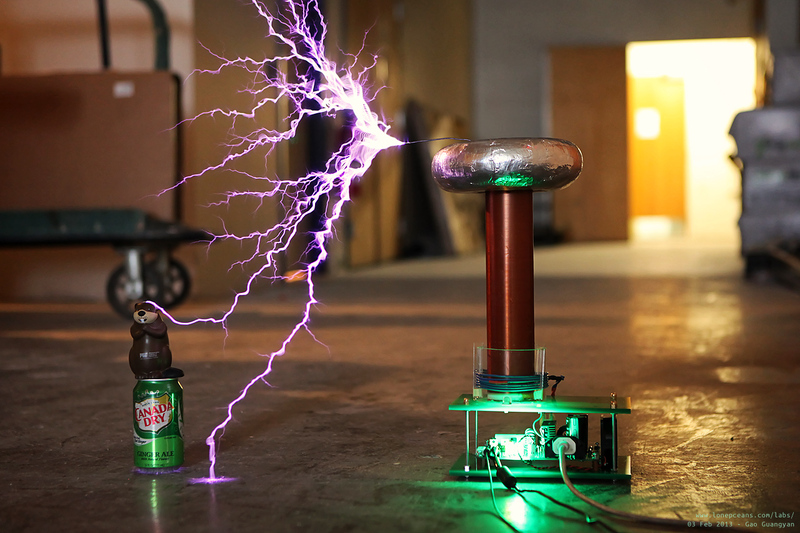 The oneTesla project was inspired by Dan McCauley's EVR single-board MicroBrute DRSSTC, was was in turn essentially based on the DRSSTC 0.5 design pioneered by Tesla Coil wizard Steve Ward. This coil currently has a small built-in 19VDC laptop power supply for the driver which switches a half-bridge of 60N65 IGBTs. These transistors have been pushed to about 300A and seem to run reasonably reliably. Over the past few weeks constructing the coil, I've modified several parts and faced several setbacks, but have finally managed to get the coil working very well! Originally, the coil used a singe 68nF 940C-CDE primary capacitor but that made my primary frequency about too high and I lost a 60N60 half bridge. Eventually with 6 turns of AWG14 and a larger 100nF tank cap, the coil is in tune with a performance I'm very happy with. There are many people I'd like to thank for giving me invaluable help on this project. 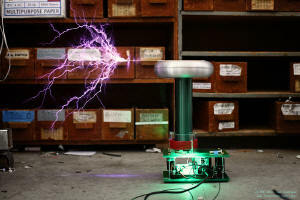 Most of all I'd like to take the folks at 4hv.org for providing a wealth of information over the years on Tesla Coil design. Also, many thanks must go to Steve Ward for his invaluable DRSSTC designs which have become the basis of many coils. The driver is based on oneTesla's older driver, as is the MIDI interrupter first designed by Kramnik. I'd also like to thank Bayley for helping out with much of the debugging of the coil, as well as for lending me a lot of materials and parts for the project. 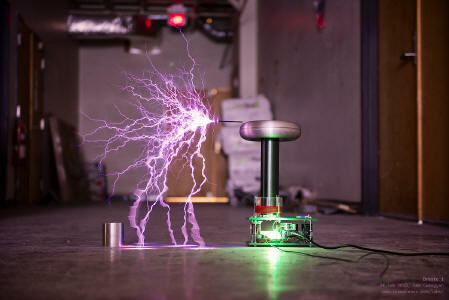 Finally, I'd like to thank Philip and Rob for their advice and inspiration with my Solid State Tesla Coils. The design of the SSTC can be basically split into:  The Logic Control Circuit  The Power Circuit and  The Interrupter. This section explains my design choices, as well as what I have learned through the progress of this project. The power inverter of a DRSSTC is no different from an SSTC - see the link above for how a conventional SSTC driver works. The main difference between the two is simply the addition of a resonant tank capacitor in series with the primary coil. In a normal SSTC, primary currents are relatively low because they are limited by the inductance of the primary (and streamer loading). With the addition of a series capacitor, the reactance of these two components cancel leaving no reactive component, so the only resistance the primary current sees is the physical resistance of the primary wires and the ESR (equivalent series resistance) of the capacitors. This allows the primary current to flow unimpeded, and this results is much bigger sparks! The only thing left to do is to tune the primary circuit so it matches* the secondary circuit. (* In practice we may or may not want this to match depending on how we plan to drive the coil, as well as to take into account streamer loading). For this project, I decided to go with a simple half-bridge circuit much like my SSTC 1. This reduces components and costs by half, but also halves the drive voltage across the primary. 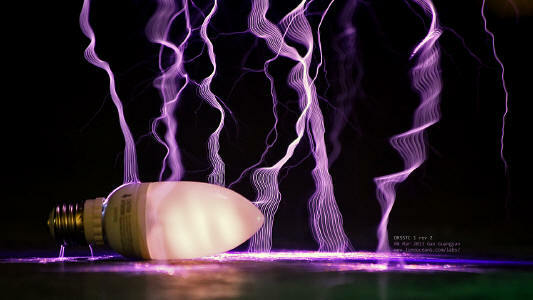 To make up for this, I'll use a simple voltage doubler to get a 340VDC bus from 120VAC. Therefore the bridge will see +- 170V. Despite it's continuous-looking operation, a DRSSTC is in fact a pulsed device operation at several hundred beats per second (BPS) - also known as the pulse repetition frequency (PRF). Unlike an SSTC, a DRSSTC cannot operate continuously. A DRSSTC operates at significantly higher peak currents than an normal SSTC due to the double resonant circuit. Therefore, if unchecked, the primary current would simply grow larger and larger, exceeding the switching capabilities of the transistors leading to violent component failure. This is where the interrupter comes in - it essentially interrupts the operation of the coil so each burst runs from several tens to several hundreds microseconds long, at a frequency between a hundred to several hundred times a second. This limits the total duty cycle of the coil to somewhere on the order of 10%. Finally, the interrupter is usually a hand-held device away from the coil so the operator can control the coil from a distance. In order to reduce interference, a fiber optic transmission is usually done. Lets take a closer look at them. In a normal SSTC, we want to drive the primary at the resonant frequency of the secondary, hence only secondary feedback (or antenna, which is essentially secondary feedback) can be used for a self-oscillating driver. This can for DRSSTC operation also, since the primary is tuned to have the same resonant frequency as the secondary. However, due to the high peak currents in DRSSTC, we really want to switch our transistors with as little stress as possible - i.e. switch when the current changes direction - zero current switching. Primary feedback allows this better, thus most designs these days run on primary feedback. But you could certainly get a DRSSTC to work with secondary feedback. Building on, zero current switching and the interrupted operation, we now have a new problem - what happens if the interrupter pulse ends exactly when the primary current happens to be the largest? Our transistors will now try to switch off at hundreds of amps! Thus a flip-flop is added, so now the bridge is only turned off at the next primary zero-current crossing after the interrupter switches off. For example, if our coil has a period of 10us (zero cross every 5us), and we set our interrupter duration to 58us, the driver only switches off at 60us. With such control over the driver, the tesla coil community realized that they could module the pulse repetition frequency to make music! 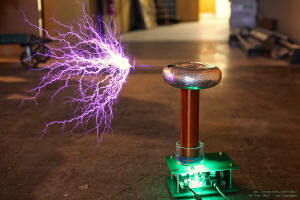 For example, driving the coil with a PRF of 440Hz produces 440 sparks a second, making a (harsh sounding) A note! By carefully modulating the drive PRF, music can be made! For this coil, I etched a PCB holding a ATmega328 microcontroller which interfaces with a MIDI device (e.g. keyboard or a USB to MIDI adaptor connected to a computer). The micro reads the MIDI signal and determines the velocity and the pitch of the note, and scales the pulse-width and PRF respectively to send to driver! Now we can make our Tesla Coil a musical instrument! This even works well for polyphonic notes - we can simply overlay the notes together. This works because the the pulse widths are much shorter than the PRF periods, but only to a certain extent - otherwise the duty cycle becomes closer and closer to 100%, and not only will notes merge together, but the primary currents will rise too much. In practice, two-note polyphony seems to provide the best practical performance. This section details the construction specifics of DRSSTC 1. Being a coil of small stature, it took surprisingly little time to piece together. The main enclosure was made from two pieces of green acrylic, held together via four threaded rods. Two end-caps were machined to fit perfectly in the secondary, which are screwed on via two nylon bolts each. The end-caps are tapped to accept 10-24 nylon screws which secures the secondary coil to the base and the toroid to the top. Over the course of several weeks, DRSSTC 1 went through a few revisions, each time improving the design both mechanically and electrically. 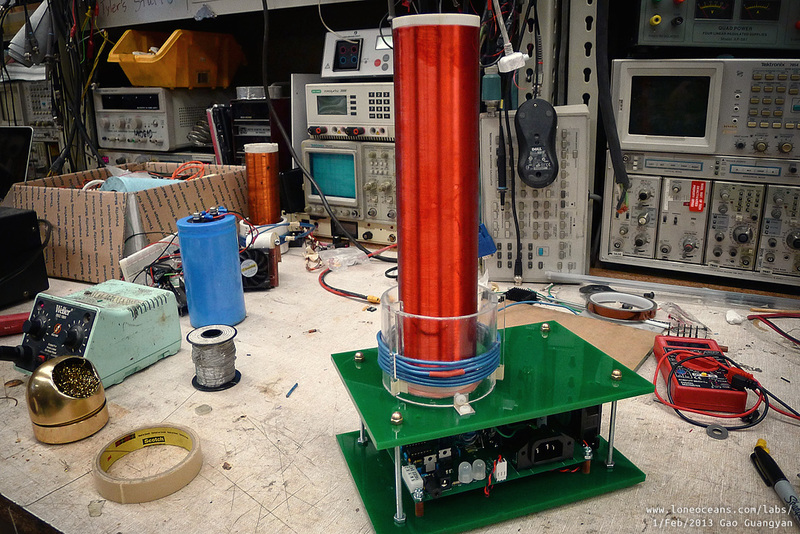 Based on the design goals above, the first design of DRSSTC 1 used a single 68nF polypropylene metalized film capacitor as the resonant capacitor. This was a 3kVDC 940C series CDE capacitor, well suited for use in Tesla Coils due to its robustness and proven reliability. The primary coil was set at 6 turns of coarse-stranded 14AWG wire which was available on hand, wound on a 3.5" diameter acrylic cylinder, with the bottom of the primary coil just about half an inch above the bottom of the secondary coil. I was still waiting for the varnish to dry on my just-wound secondary coil, so I borrowed a secondary coil which was wound on the same-sized PVC former. This secondary coil was 2.4" in diameter, wound to a length of just about 10.5". Although it was wound with AWG36 wire, it was wound quite loosely with an estimated 1650 turns of wire or so. For the topload, I used my home-made form toroid, measuring about 2.2" x 7.5", running about 300kHz or so. My freshly wound secondary coil was finally complete - the specifications are as follows: 2.4" diameter, 36 AWG wound for 10.25", just about 2000* turns. This was one of the most challenging secondaries I've wound, taking just about 3 hours to wind with some rest breaks in-between. It was coated with about six-layers of spray-on Polyurethane varnish. I swapped the old secondary I borrowed and replaced it with the new secondary. This was a problem. I turned on the coil and it did work well, producing sparks easily, but the coil was producing much smaller sparks than expected, without any ground strikes even with the pulse widths turned up. Eventually, the coil gave up and lost it first set of 60N60 IGBTs. In addition, I also did a few improvements to the power circuitry - first I added a 10A fast-blow fuse to the primary circuit. I also decided to make the coil more portable by integrating its own logic power supply unit (a 19V 2.1A SMPS for small netbooks I bought off ebay for $4). Next, I installed a power-bus switch to turn on primary power bus only after the 19V power supply had kicked in. The 60N60 IGBTs were also replaced with 65N60 IGBTs, which, according to the datasheets, suggest that they are essentially similar, but the 65N60s are a dollar cheaper and come in a slightly different package. I used a larger heatsink and replaced the fan with a more powerful one. Finally, I borrowed a 8" x 2.2" AmazingOne aluminium spun toroid from Bayley to finish off the coil. As a result, the entire setup is now very compact and clean, with only 1 IEC calbe required for power and 1 fiber optic input. It was time to test the revised coil! I plugged in the coil and slowly ramped up the power - it's working! 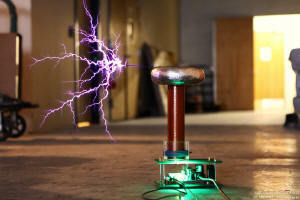 However, there was immediately a huge problem - racing sparks up and down from the secondary to the primary coil. Indeed, while 8 turns had produced the correct resonant frequency, it also upped the coupling from k = 0.22 to k = 0.27, probably far too much for this geometry to handle. The photograph shown here shows the only photo I got before the racing sparks forced the test to end. Notice the corona glowing off the top turn of the primary. Note that this was running at shorter pulse widths than before, around 75us or so, but producing sparks similar to revision 0. So it was back to the drawing board. *Update - here's what actually happened. I had missed taking into account the insulation of the wire, and it turned out that the actual number of turns of wire was closer to 1750, and the actual resonant frequency of the secondary was closer to 260khz or so. In the first revision, the coil performed ok since the freqs were in tune to begin with, but streamer loading prevented spark growth. In revision 1, the primary turned out to be 20% lower than the secondary with too much coupling, leading to poor performance. The first thing I wanted to do was to reduce the coupling of the coils, so I played around with JAVA TC a bit and came up with a solution. I could reduce the coupling by changing the primary turns back to 6 and swapping the tank cap with a 100nF one which maintains the same primary frequency. This was a 100nF 940C CDE metal-foil capacitor from a previous project. This new geometry drops the coupling to k = 0.22. There are several different methods and drive modes which can be done to create good DRSSTC performance, and it all comes down to what you really want to achieve. In the classic tuning approach, the goal is actually to tune the primary slightly lower than the secondary. 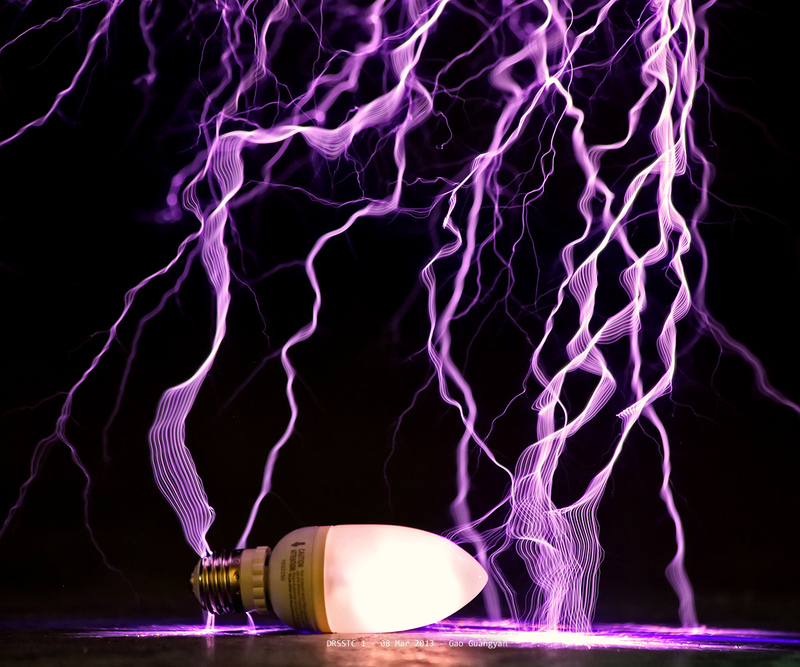 During operation, sparks form which increases the capacitance of the secondary circuit and decreases the resonant frequency. This phenomenon is known as streamer loading. At the beginning the coils are out of tune, and due to the lower primary frequency, the coil is essentially driven at its lower pole frequency (I'll have to describe this more in a future article). Due to this mismatch, primary current is high. Once spark breakout occurs, the secondary freq drops, bringing the coil more and more into tune. 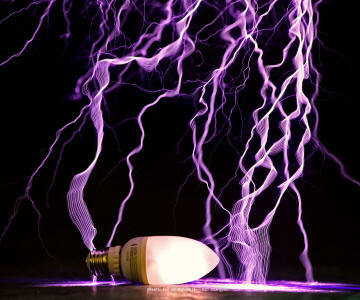 The result is a coil with low spark output at the beginning, but a sudden burst in spark growth at a certain point. At this stage, my primary is now tuned to be around 225kHz with the secondary at 270kHz (toroid changed), about 20% detuned. I tested the coil with trepidation. 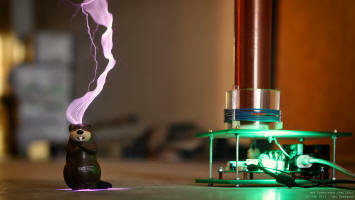 Fortunately, all the calculations had paid off and the coil performed remarkably and far better than I had hoped. With the interrupter set to a modest 75us, I was easily getting ground strikes! 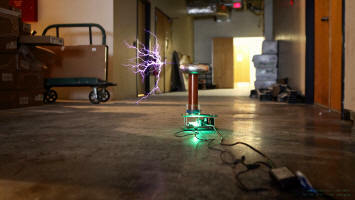 The sparks are now far more intense, louder and brighter than before with even less pulse-width. It looks like I might have hit the sweet spot of resonance! I decided to set the interrupter to a max of 100us to increase reliability of the coil. After many weeks of hard work, I am now happy to say that the coil is now performing as I had hope to be, and some more! This revision is about as good as this coil will get for now, given that it's already producing sparks wayy bigger than itself. Continue below to see more photographs of it in action! The coil is currently detuned about 20% lower than secondary which works great for large spark growth, but puts a strain on the IGBTs due to the high peak currents. This can be improved by a less aggressive detuning by 10 or 15% lower. Finally, I realized that as the secondary wire thickness goes down, the thickness of the insulation begins to matter significantly. For example, this coil uses AWG 36 wound for 10.25". This would mean 2050 turns of wire, but I found it closer to be 1750 with JavaTC modeling and real measurements. We can calculate that, assume 99% wire fill density, that each wire is actually 5.8 mil (0.0058") thick, with the insulation being 0.4 mil thick per side. This means a 1" long winding will not have 200 turns of wire, but practically speaking, more like 170 turns. Something to keep in mind. First light! After several weeks of construction, DRSSTC 1 (rev 0) is ready for its first light. Note that the photographs above are of revision 0, with the coil running at around 270kHz resonant frequency with a half bridge of 60N60SMD IGBTs. 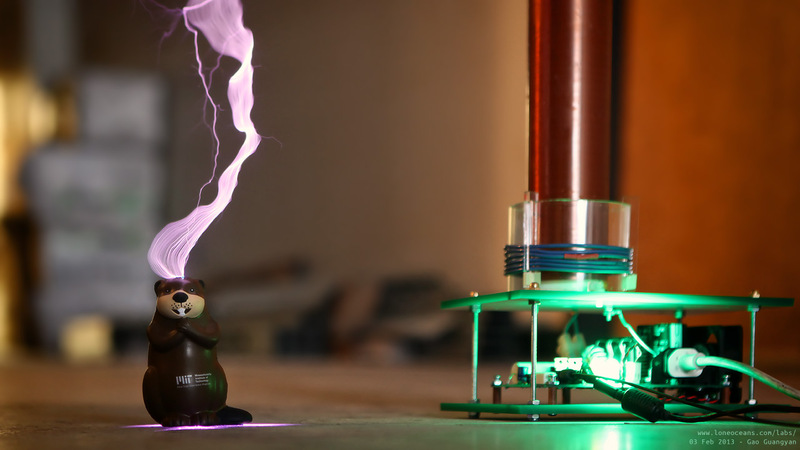 The above shows a video of the coil in action. Notice how even with 145us on-time, the spark length is not terribly impressive. 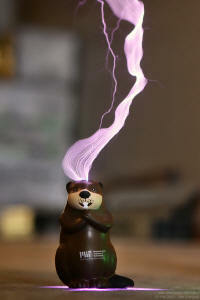 Most interesting here is a close up of some of the sparks hitting Tim the Beaver! Note that you can see how each 'note' is actually comprised of many individual sparks, each created with one pulse event lasting about 145us. 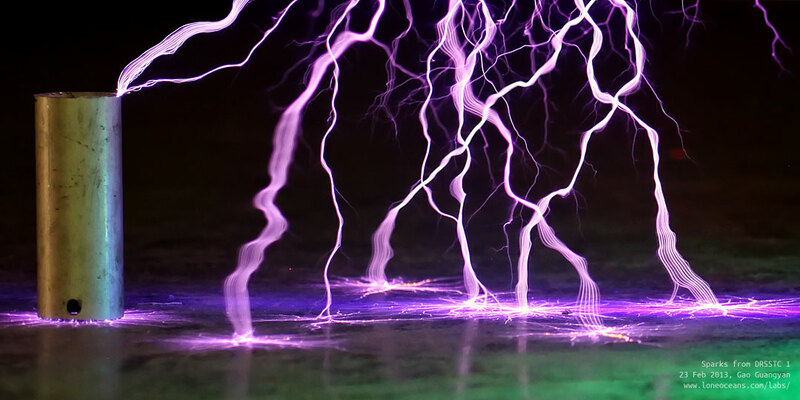 Each spark heats up the air around it, hence the second spark is likely to follow a similar path as the partially ionized air-path is easier to go through. This results in sparks forming in parallel. Fascinating! The following photographs show revision 2 of the coil running at <100 us with much better performance than revision 0. Performance is very impressive and I am surprised as to how well the coil is performing! I also managed to get a few photographs of the ground-strikes on concrete, which look absolutely fascinating! I also tried to set up a quick and easy spark-length test. The metal rod on the left is simply balanced on a non-grounded push-cart with rubber wheels, so it's not exactly the best ground-strike test, but it does show how easily DRSSTC 1 makes 22 inch sparks. Right now, most of the sparks are simply hitting the ground. I will need to do a more accurate ground-strike test by aiming the breakout point upwards. 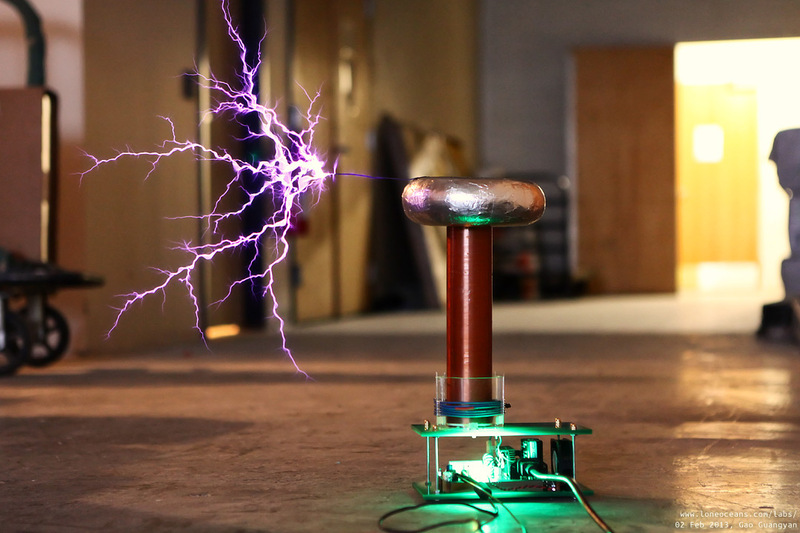 More tests of the coil in action now featuring a compact fluorescent bulb which lights up in the electric field. I also made a quick overview video of the coil in action. It's the same video as the top of the page, but shown here again for convenience. I hope this page has been useful! This coil was built in a relatively short period, but I managed to get it working quickly and well. I would like to thank Bayley and Kramnik for their work developing a small single PCB tesla coil, as well as the online high voltage community for years of great discussions. Also a shout out to Bart Anderson's JavaTC which has been an invaluable resource for coilers all around the world.